Preheat oven to 200°C (400°F). Place the curry paste, coconut milk, stock, fish sauce and sugar in a large bowl and mix to combine. 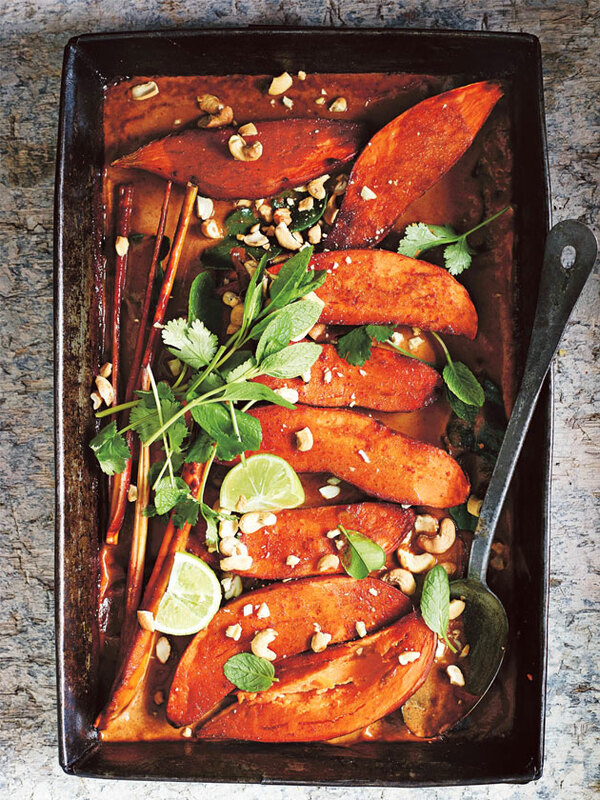 Place the sweet potato, lime leaves and lemongrass in a large roasting dish and pour over the curry mixture. Cover with aluminium foil and cook for 40–45 minutes or until the sweet potato is tender. Remove the foil and cook for a further 15–20 minutes or until the curry sauce has reduced slightly. Top the curry with the mint, coriander, cashews and lime wedges to serve. Serves 4.